WARNING: they can be a little dangerous as you might be able to eat several of them in rapid succession (or so I’ve heard ;)). 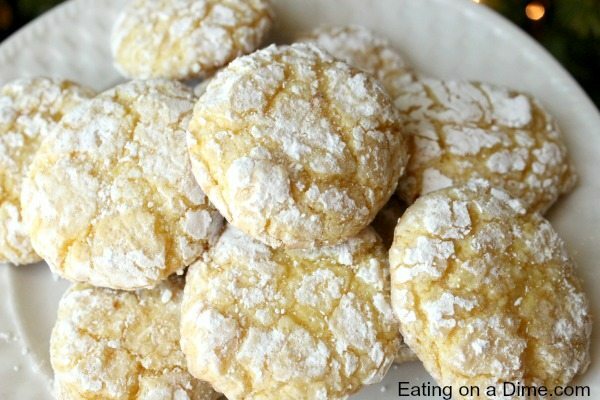 If you are not convinced that you want to make these lemon crinkle cookies there is one more thing I forgot to tell you – they are very easy to make! I am talking 4 ingredients, ready in 10 minutes easy. Preheat oven to 350F. Spray Cookie sheet with non-stick cooking spray. 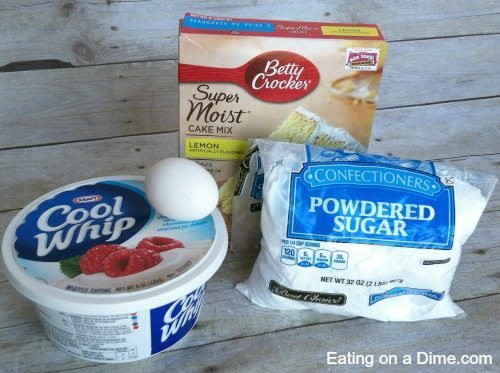 In a large bowl, mix together cake mix, cool whip and egg. The mix will be VERY fluffy. Just keep mixing until well combined. 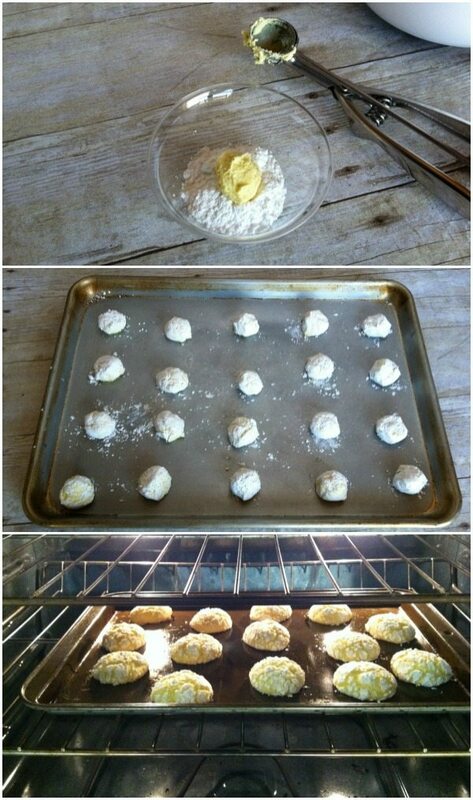 Use a small cookie scoop or two spoons to drop rounded cookie dough into powdered sugar. Roll dough ball until completely covered. Set cookies on cookie sheet, about 2 inches apart. Bake at 350F for 8 minutes or until very lightly golden around the edges. Let cool on the cookie sheet for a couple of minutes before removing to wire racks to cool completely. 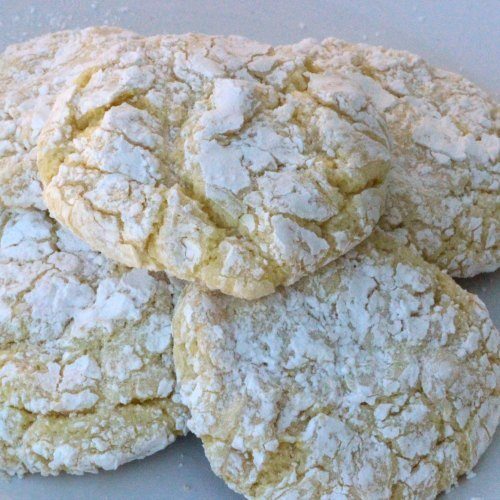 Make this recipe for lemon crinkle cookies today. I’ve heard that the yellow cake mix is good too! What other varieties will you make? 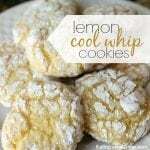 These Lemon Crinkle cookies are delicious! 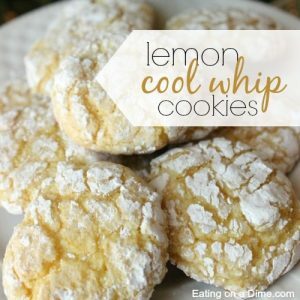 Just 4 ingredients to make this easy lemon cool whip cookies recipe. The Best Cake mix cookies! Store at room temperature in airtight container. These are best eaten within a day or two of baking. Feel free to substitute the boxed lemon cake mix with any other boxed cake mix. That is it! I told you this was a very easy recipe. Whether you make these cookies for your next cookie exchange or just for your family to enjoy at home, you will want to make these soon. They really are easy and delicious! Check out all the posts in our Christmas cookie exchange recipes. Does the Cool Whip need to be thawed? Yes, it will be easier to work with if the lemon cookies are thawed. Can you use any flavor cake mix or does it have to be lemon? Just made these tonight- I made one dozen and then taste-tested. In my opinion, the cookies were not lemon-y enough, so I added some lemon zest to the remaining batter. I prefer them with the zest. I also really like lemon, so it could just be me! How many cookies does one box make? I need 7 dozen (yup 7!) for my cookies exchange. When my cookies cooled off they became very flat- is there a way to avoid this from happening? My didn’t get very flat, but I make mine small and I didn’t flatten them out before baking. Try that and let me know if that works. 24 – 36 depending on how big you make your cookies. Yes it does Lizz. 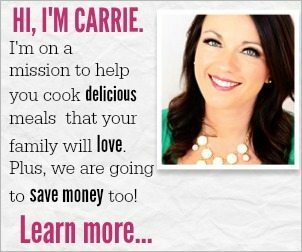 I love to make this same recipe with Strawberry cake mix. YUM! That is a great idea – Lynn. I have tried this with Stawberry cake mix too. Ashley- I would think you can do this with any flavor – I know we love them with Strawberry cake mix. My favorite for the holiday season are the Lemon and also the Spice cake. Super yummy. do these freeze well? I want to make them ahead for Christmas. Should these be crunchy at all? Or just very soft? We have had the lemon, strawberry and devils food cake! They are all wonderful! Has anyone tried freezing these……either before baking or after?? I haven’t tried it yet, but I would think you could freeze them really easily. Since cool whip freezes great, I would think freezing them before would be perfect. I would just allow them to thaw on the cookie sheet before baking them. Thanks is great to know Tracie! These are slightly crisp on the edges but really soft in the center. Kate, Where are you from? In Oklahoma a tub of cool whip net weight is 8oz, so just use 8 oz. Melissa, I’ve never frozen them, but I would think they would freeze great. I have made these. Kids love them. It depends on the cookie scoop you have but about 18 to 24 cookies if you use a small scoop. I’m so happy the kids loved it. Cookies needed more time to bake, 12 – 15 minutes would be better. I got 42 from one box of chocolate cake mix. Had these at my mother in laws and they are awesome!! I’m making strawberry for my grandson while we are snowed in with this big winter storm!! Thank you for the recipe? Will they still taste good if they aren’t covered in powdered sugar? Yes, I think it would still be great. Oh strawberry would be amazing! 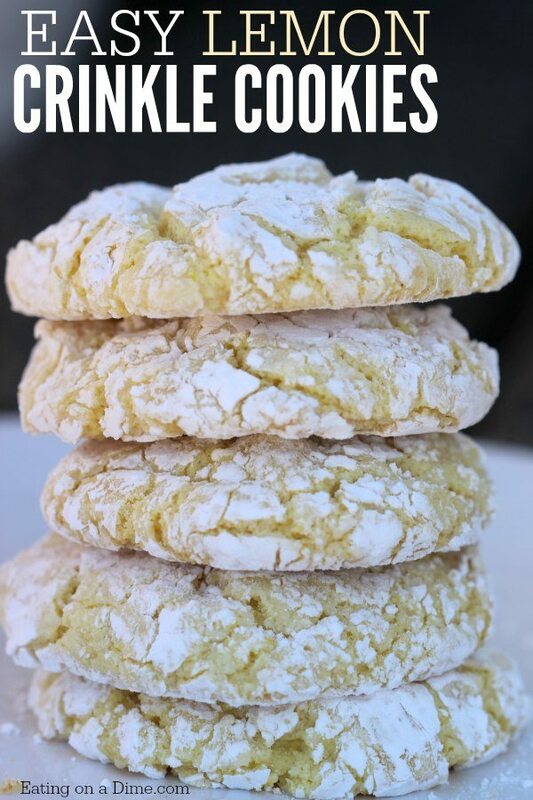 Oh my gosh…..these lemon cookies are delicious! So easy to make and very addicting. I love lemon and they are perfect for me.. I got 36 cookies from one batch, they are fluffy and just browned a little on the bottom……perfect. i made the recipe by using gluten free cake mix and lemon flavoring and zest to the mix and yum they were great ! I have made these cookies with a variety of cake mixes. I used red velvet cake mix for a wedding, Christmas, and Valentine’s Day. I have put the already made cookies in the freezer in gallon ziplock bags and they were fine when I thawed them. We use Strawberry cake mix and It’s delicious.. ..So is chocolate. Why do the chocolate cookies not stay puffy like the others? They’re all same size, I refrigerated the dough, etc. any ideas? I used a Betty Crocker triple chocolate cake mix and they are fantastic! Have been making lemon, spice, carrot and of course strawberry for last few years but the we triple chocolate are a new suprise! Have you used a stand mixer? Thank you for this great recipe. I’m making some right now with a Duncan Hines Orange Supreme cake mix. First batch just came out, they are delicious. Orange cake doesn’t have the pouch that the lemon does, but tasty all the same, like eating a cookie version of a Dreamsickle.